Thanksgiving is a special day in this country, not just because of the turkey and football and relatives, but also because of the historical memory that lies at the heart of it. The story of the pilgrims and the Indians is our national story, which means we’d better get it right. To do that, we had the honor of speaking with Dr. Tracy McKenzie over the phone. Dr. McKenzie is professor of American history at Wheaton College, where he serves as chair of the history department. Here’s a lightly edited transcript of our conversation. Daniel Davis: Dr. McKenzie, I think all of us have seen and grown up with those pictures of the Pilgrims eating a nice, big turkey Thanksgiving meal, sometimes with the Indians at Plymouth. Give us the straight scoop here—are those pictures accurate? Tracy McKenzie: Well, I think you know the answer to that, Daniel. The answer is, not very. Most images of that event really date to two to two and a half centuries later. So the late 19th century is when most of those images really began to crystallize. If I were going to try to very briefly describe for you what I think the setting would’ve looked like at the time, it would probably sound to you a lot more like maybe a Fourth of July barbecue or something like that. It would’ve been outdoors, the Pilgrims had almost no furniture to speak of in 1621, so we would imagine them sitting on the ground. They’d be eating with their hands, because they had very few utensils—it would’ve been uncommon for them to have really anything more than a knife. And certainly not a fork—those weren’t really in use much among common people at that time. So they’re sitting on the ground, they’re eating with their hands, and they’re consuming copious quantities of a meat of some kind. The evidence would say, lots of water fowl, which is something the record does suggest. No specific reference to turkeys with regard to the celebration. But we know from other sources that in the autumn, the sky would just grow dark with the geese and ducks and swans and herons and cranes, all of which could have been on the menu. Most of the side dishes that we would expect would not have been there. Sweet potatoes weren’t indigenous to the area. There were lots of cranberries but no sugar, so if you wanted to have a really tart side dish, I suppose you could. They wouldn’t have had pumpkin pie. They almost certainly had stewed pumpkin, but they didn’t have sugar, they didn’t have flower for crust, and they didn’t have ovens to bake pies in. So that wouldn’t have been there either. They also might have had eel—I’ll just add that because they bragged very much about the fat and juicy eels available in the area. And with regard to vegetables, their most common vegetables would’ve been turnips and maybe cabbages and carrots. So I always say for a more authentic Thanksgiving meal, I’ll sit on the ground and have turnips and eel. Katrina Trinko: Well, good luck making that catch on. I think I’m OK with our revisions. I’d say we’ve improved it a little bit. But I think you’d also touched upon other myths about what happened. One of them being, of course, we talk so much about Thanksgiving and religious freedom and the pilgrims coming here for religious freedom, but I believe your book indicates that the story’s a little more complicated than that. McKenzie: That’s right, Kate. In fact, when I think about things that we could learn from the Pilgrims, the kinds of questions we could ask that really could lead to life-changing kinds of conversations with them, the question of why the Pilgrims came to New England is right at the top of that list. Our common, brief explanation of their motive says that they came to flee religious persecution and to find a place of religious liberty. And that’s about 50 percent right. They certainly wanted to find a new home where they would be able to worship God as they believed that the Scripture required them to. But that’s not the same thing as saying that they came fleeing religious persecution, or in fact that they lacked religious freedom where they lived at the time. We so often forget the part of the Pilgrims’ story that takes them from England, not to New England directly, but actually to Holland. So from about 1608 to 1620, they were living in Leiden, which was a city of about 40,000 people—very large, cosmopolitan, and pluralistic. And the Pilgrim writers say it was a place where they actually enjoyed considerable religious liberty, and they actually believed that their congregation was spiritually flourishing. So they were not motivated to leave Holland primarily because of religious persecution—they hoped to find a similar kind of religious liberty in North America. The motives that they share for leaving can be put into two broad categories. One has to do with the attributes of the surrounding culture—the way that the Pilgrim writers describe it, they characterize it as a very permissive culture, a culture that is difficult for them as parents trying to raise their children faithfully. They believe that they’re “losing” their children—that’s actually the language they used—that they’re losing their children to the surrounding culture in some ways. And then they also emphasized the economic context. Most of the individuals that had left England for Leiden were rural, they were farmers by trade. But in Leiden, they are in this very industrial kind of city, they’re working as weavers, as piece workers, pretty much from dawn to dusk, six days a week, and they’re struggling to survive. And so they’re hoping to find a new home where life will simply be a little less arduous. The reason I think that’s very important is that, when we describe the Pilgrim story as a story of fleeing persecution, we’ll nod our head admiringly in a sense, but very few of us, at least in the United States, can wholly relate to what we think we’re describing. But the Pilgrims’ concerns, at least the ones they were emphasizing, are actually much more mundane, and I think much more relatable. They’re talking about the cares of the world that are weighing them down. And I think it makes their story immediately, totally pertinent and relevant to us. Davis: Well something else that you discuss in your book, which comes later on after they’ve left Holland and head to America, is the Mayflower Compact. And of course, a lot of Americans remember the Mayflower Compact as a seminal document, if not for our government, at least for our historical memory and sense of identity. Can you flesh out what the Mayflower Compact was, and how we should remember it? McKenzie: Great question, Daniel. I can tell you just really quickly what it was, and then we might debate how we should remember it. But the Mayflower Compact is the kind of covenant—that’s the term they would have used—that the free adult males on the Mayflower ultimately signed off on after they arrived off the coast of Massachusetts and more or less identified a place to make a permanent home for themselves. They had been blown off course, which is a pretty familiar part of the story, they landed significantly farther north than they had anticipated. And that’s significant because where they actually ended up was beyond the northern-most boundary of the Virginia Company’s domain. That was a joint stock corporation that had been chartered by King James I, and had given the Pilgrim group a kind of permission and authority to settle within their boundaries. So arriving off the coast of Cape Cod, they’re really in a sense outside the boundaries of authority of exiting the English presence there—and in a certain sense, operating in a kind of state of nature almost, if you want to think of it that way. And so, in agreeing to a covenant to basically arrive jointly at a law that they will mutually pledge to submit to, they are establishing a kind of framework for self-government. That, however, I think is a little misleading—at least in the way that we remember it. Because you’re right that we tend to remember the Mayflower Compact as one of those founding documents of the American story. And I think in so doing, we tend to impute values to the Pilgrims in the 1620s that they would not have held. The Mayflower Compact actually begins with a kind of pledge of submission to the king, and if anything, it is at least as much an assertion of the divine right of the British monarch as it is to some sort of natural right to self-government. An 1876 depiction of the Pilgrims’ arrival titled “The landing of the Pilgrims at Plymouth, Mass. Dec. 22nd 1620” by Currier & Ives. The Pilgrims, what we know from later on in their experience in Plymouth, they didn’t hold a lot of the political values that we today often impute to them. They certainly weren’t democratic, they were absolutely hierarchical in their political values, they tended to identify certain elites among their midst that they believed were sort of naturally endowed with qualities that qualified them to lead and others to follow, and they saw that as a kind of obligation. So one of the first laws passed in 1627 in Plymouth made it illegal for someone who is chosen as governor to decline. If you declined, you would’ve been hit with an enormous fine. They didn’t have adult male suffrage, or at least not universal adult male suffrage, and they were very hierarchical. So I think the temptation, I think, will be for us to imagine the Pilgrims as sort of proto-democrats that envisioned the future to be pretty much what we now take for granted. Trinko: So we’ve talked a lot about some of our misunderstandings or historical revisions of Thanksgiving. Could you talk a bit about how this modern myth of Thanksgiving got created in the United States and, even if not historically accurate, what was the sentiment driving it? McKenzie: Great question, Kate. Historical traditions evolved often in very sort of haphazard ways, and often there will be a number of variables that are at play in developing the kinds of historical memories that we have. 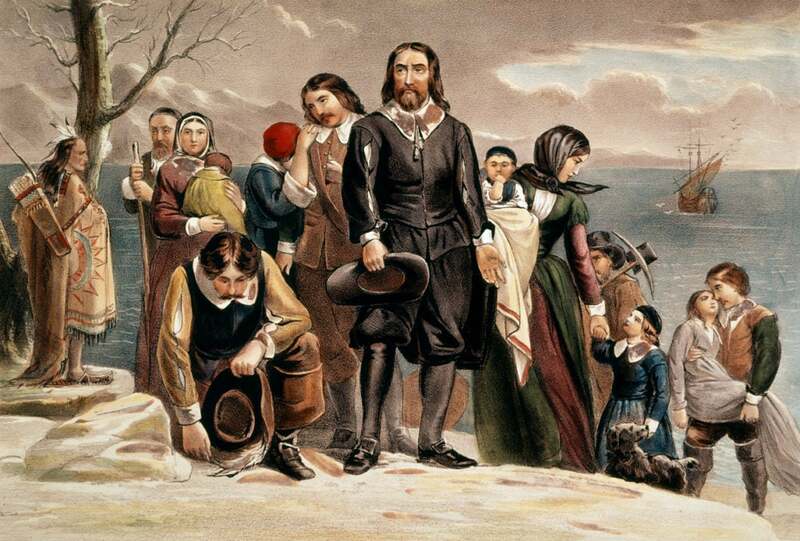 One of the things I think is so fascinating about the evolution of the Thanksgiving holiday is the relationship between that holiday and memory of the Pilgrims. And it’s a really tenuous kind of relationship. “Of Plymouth Plantation,” in manuscript form, disappeared for a period of well over a century. It was probably passed around and then gradually sort of vanished from view. And it was actually rediscovered in the middle of the 1800s, so more than two centuries later, in the library of the Bishop of London. And it was brought back to the United States with great fanfare in the 1850s. But by that time, it was already the case that in New England, there had developed this regular pattern of celebrating fall thanksgivings. Often there would be days of humiliation and fasting in the spring, when the planting was finished, asking God’s blessing on the growing crop, and then they’d have a day of thanksgiving in the fall after the harvest. And that was very much a regional tradition. As late as the Civil War, Thanksgiving was primarily celebrated in New England and in areas settled by New England migrants. Most Southerners, for example, wanted nothing to do with Thanksgiving. They associated it with pharisaical, self-righteous Yankees, and they just didn’t observe it. Conversely, New England tended not to celebrate Christmas. The Pilgrims very famously didn’t celebrate Christmas. They said, “There’s not a place in Scripture that authorizes the celebration of Jesus’ birth. There’s no scripture that tells us when it occurred.” And they saw it as an invention that the Catholic Church had basically created. And so you have this really interesting pattern in which the South celebrates Christmas, and the North celebrates Thanksgiving, and never the two shall meet. The first time that you really would say that Thanksgiving becomes a national holiday is during the American Civil War. And that would not have been realized at the time—we see it more from hindsight. But Abraham Lincoln in 1863 issued a proclamation in the fall, making the fourth Thursday in November of that year a day of national Thanksgiving. And he primarily means it as a day of thanksgiving for the way that God was aiding Northern armies in the war against the South. And that also doesn’t endear Southerners to a Thanksgiving holiday. It’s really the late 19th century, it’s really the 1880s, 1890s before Thanksgiving is broadly celebrated around the United States. And I joke—but also sort of mean it seriously—that one of the things that ultimately reconciles Southerners to Thanksgiving is the development of football. And by the 1890s, the national championship game for what was the forerunner of the NCAA was being held annually in New York City on Thanksgiving Day. And well before 1900, the tradition of having football games on Thanksgiving Day is sweeping across the country. And Southerners find out that the holiday isn’t that bad after all. Davis: That’s such an interesting evolution there, and of course looking at Thanksgiving, just in the last hundred years, how we’ve had the introduction of Black Friday and the shopping and all of that leading up to Christmas. Davis: Macy’s parade, yes. So Dr. McKenzie, this is so interesting. I’m just curious, what would you say about remembering Thanksgiving? Today, I think a lot of us would be very surprised to learn that the founding era was not an era in which Thanksgiving was a public tradition. When we remember Thanksgiving, almost 400 years ago now at the beginning of the New World, how should we remember Thanksgiving? How can we rightly honor the Pilgrims who came here, and how can we celebrate Thanksgiving in a way that is right? McKenzie: That’s a good question, and one that even now I’m still working through myself. But I do have a few thoughts. For all of the work that I, as a historian, do, in sort of scraping away the kinds of myths that have developed over the years, I find that the true story is actually more interesting and more inspiring than the myths that we have developed over time. I do find a great deal about the Pilgrims’ story really admirable. When you stop and think about the venture that they were a part of, the great personal toll that it had inflicted on them, when you think about that celebration, it was a celebration predominately of widowers and orphans. There had been 18 wives on the Mayflower, 14 of whom had died in the first winter. And so most of the married couples now were separated by death. Large numbers of the children had lost a parent, there were some children present who had lost all parents and siblings. It was an overwhelmingly male, now single gathering, and also a young gathering, in that about half of the group was teenagers or younger. And so to have any kind of celebration in that context I think is a real tribute to a kind of steadfast faith that I totally admire. The other thing that I always think of, personally, about the Pilgrims at this time and other times in the year, is just the sense of identity that they themselves have. It’s a tragic thing in a sense that we have lost the weight of the term that they used for themselves, or that William Bradford used in describing them—this concept of pilgrim. So it means nothing to us except a kind of label for the passengers of the Mayflower. But when Bradford calls them Pilgrims, he’s actually writing about their departure from Leiden. And he knew, and they knew, that many of them would likely die in the undertaking, that the chances of seeing loved ones that they were saying goodbye to were slim. And Bradford says that they were deeply moved, that their tears flowed like water. But he says that they looked up to the heavens and they comforted their spirits, because they knew that they were pilgrims—by which he meant, they recognized that their hope, ultimately, was not in their immediate prosperity, it was not in any kind of bounty that they might encounter in a new world. Their hope was ultimately in God’s sovereign love and care for them, and the promise of eternity. And that’s just a vision of that idea of pilgrimage that I think we’ve entirely lost. And so one of the things I try to do, and I challenge others to do, is just to tell ourselves, to remind us that we are pilgrims, in that sense, we’re sort of bound together with them, if we cling to that same sense of identity. Trinko: So much to think about there. One little bit less serious question, I believe you also mentioned the contrary to all the picture books I read as a child and costumes in school plays, the pilgrims did not wear black with huge white collars. McKenzie: I am so sorry. Trinko: What did they actually wear? McKenzie: Yeah. They didn’t wear black, and they didn’t wear those incredible high hats, and they didn’t wear enormous buckles on every sort of appendage. Yeah. Again, that’s another example of how in our mind’s eye, we have an image of the Pilgrims that pretty much dates to the late 19th century. Here we can speak with a little bit of confidence because the Pilgrims, among many things, were amazing record keepers. And so even as early as the late 1620s, we began to have surviving records of their wills, and one of the things that happened when someone would die, of course, is they would typically make a list of all their property that was to be divided among heirs. And in the early 17th century, one of the most valuable kinds of property people had was clothing. And so they would list their clothing and actually talk about it in some detail. So the Pilgrims loved bright, bold colors. And so that’s another thing, I suppose, when we’re imagining them sitting on the ground eating with their hands, let’s imagine them wearing orange and red and yellow, not black. They weren’t wearing buckles because they actually disliked any kind of adornment like that. The women didn’t wear jewelry of any kind and so forth. So they wouldn’t have had that, but lots of bright colors. In fact, the will for William Bradford, the inventory of his estate shows that he had a red vest and a purple cape, among other things. So these folks would’ve been pretty striking, I think, in their fashion sense if nothing else. November 19, 2018 in U.S..